^^Constructing a suitable anchor with the standing end of the rope. ^HWith the direction of pull away from the anchor, tie a directional figure 8 loop near enough to the cliff's edge so that the climber can be observed, if possible. BfiTying a swammi Wrap around oneself, clip a locking carabiner through all the rear wraps and clip a large locking carabiner through all the front wraps. 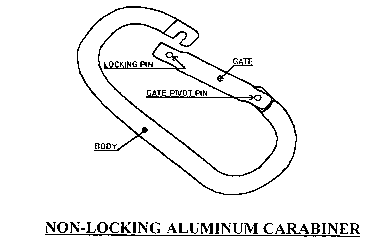 ^HSecure the rear locking carabiner into the directional figure of 8 loop. ^HSecure the running end of the rope to the large locking carabiner utilizing a suitable friction belay (i.e., munter hitch, stitch plate, etc.). NOTE: Gloves will not be worn while belaying a climber during a top rope. TRANSITION: Are there any questions over establishing a belay stance from the top? If not, let's discuss securing the climber to the rope.